A1= $62.00 This site is truly what it's name says it is.... A1. It is a shaded pull thru with 50 AMPs of Electric. It also has Water, Sewer, Cable hook ups plus Free FiWi. It is so beautiful you will want to spend your week vacation on it! 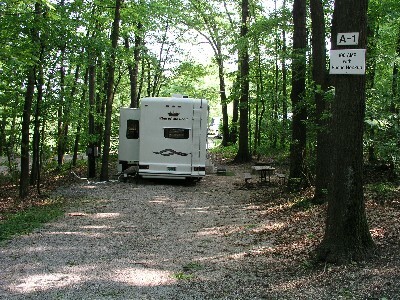 Site A- Fr and A- Bk= $60.00 This site is a double site suitable for two RVs. Site 38 and Site 42 are paved and rent for $62.00. All these sites are excellent for a week long vacation. Site A3, A4, A5= $62.00 These sites are the same as A1 except they are not pull thru. They have 30/50 AMP Electric, Water, Sewer, Cable hook ups plus Free WIFi. These shaded sites are very suitable for a week long vacation. LT 1= $58.00 This site is located near the lower rest room. It is a paved handicap assessable back in site with 30/50 amp electric, water, sewer, cable hook ups with Free WiFi. This site is perfect for the camper with a wheel chair as it is easy to sit at the special picnic table as well as wheel to the near by handicap rest room. It is kept locked so be sure to ask for the key when you check in. Site 45= $62.00 This very large site is located as you come up through the woods. It is a completely shaded back in site with 30 amp electric service, water, sewer, and cable hook ups with Free WiFi. Site A10= $62.00 This site is a shaded back in with full hook up and 50 amp electric only service. This site has excellent satellite reception. It also has water, sewer, cable hook ups with Free WiFi.